My kitchen is infused with the aromas of vanilla, and fresh baked home goodness. Can’t wait for my kids to come home from school; this is a great after school bite! You have no excuse not to make this, it is rather simple, and it’s not time consuming. You’ll have it ready to serve within an hour, that is if you can’t wait for it to cool down. I should add that it is even better when completely cooled, and stored in a plastic bag, yummy! About 2 cups of tart cherries( no more, or everything will collapse, and will not bake evenly),I use the frozen ones (thawed, of course). Get ready beforehand. Measure all ingredients in separate bowls, and have a baking dish ready; I use 9x13 inch square one. Preheat oven to 395 F.
Add baking powder to flour, and mix well, this will assure that it is evenly incorporated. Place cherries in their own bowl, and add about 2 Tbsp of flour, and shake them, so they get coated with flour, this is very important. Now, with a hand mixer, mix eggs, sugar, and vanilla sugar. Then add yogurt, and oil, and mix well. Gradually add flour mixed with baking powder, and again, mix well. Now you have the base; nice, medium thick, kind of like muffin batter. Add the cherries, and fold them in gently, and as evenly as you can, don’t overdo it. Transfer to a baking dish, and gently even it out. Bake for about 30-40 minutes or until toothpick inserted in the center comes out clean, and it‘s nice and golden in color. Dust with powdered sugar. 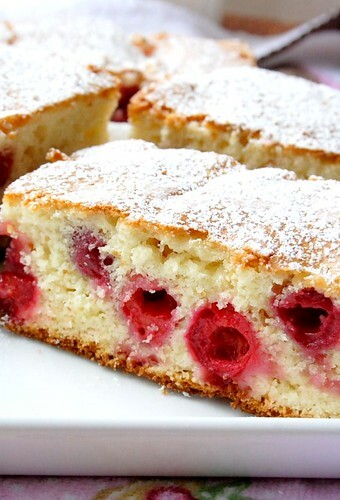 Tip: I have never tried, but I am sure this cake can also be made in form of muffins, only I would think in that case, you would add cherries individually into each mold, but also coated in flour. Here is another fruity goodness you might be interested in, from my dear foodie over at Palachinka blog. This looks quite delicious! Love it! What a beautiful looking cake! I am glad to hear I can use frozen cherries. It is so pretty and looks so delicious! Vječiti i uvijek odličan kolač od jogurta. Ispao ti je odlično i ufotkan je da mami. I love cakes with fruit. It looks delicious. This looks sooooo good. i love sour cheries. Unfortunately I can't find them here in Toronto. Where do you buy yours? Are they as good as the fresh ones? That looks so moist and delicious. I'd love to come home to a big slice of that! I am printing this out and trying it pronto! Oh wow, this looks divine! One of my definite favorites - since childhood and up until now. pretty new photos of you....awesine looking cake + can already taste those cherries just by looking! Dragana - cranberries would be a great substitute! Most berries would work! I'm sure your friend will like this cake! Mmmm... that smells as fabulous as it looks!!! What a gorgeous looking cake! I love cakes with yogurt in it - they are always so tender so moist. Love yours! A must try!!!! Thanks for sharing. I've just tried it with damsons instead of cherries and it's lovely. Thank you for the recipe. I will make this real soon. I am in the Cherry Capital after all. I can't wait to try this one. Thanks again. Melita, i love this cake but where can i find these cherries? kad kazes "plain yogurt" da li mislis na nas obicni jogurt ili na nesto drugo? ja ih pravila sa mileramom i odlicni su..hvala za recept!! I love this cake! I received the recipe for this cake from a friend. It did not quite turn out as well as I would have liked. Today I tried your recipe, and it was a SUCCESS! I’m so thankful for all these great recipes that feel like they are all from my culture, Romanian. opet povratila djetinstvo! I think I'll try your Krempite next to reminisce! By the way, where to find the cherries- if anyone has a Trader Joe's around, they're great, plus if you have a Top Valu around- they have the real german ones. (Cak sam vidjela i napolitanke nase!) Try also the black forest gateau with these! Good cheer and SUPER blog!